This is a new replacement BLACK outer NON AC Car heater and fan delete plate. 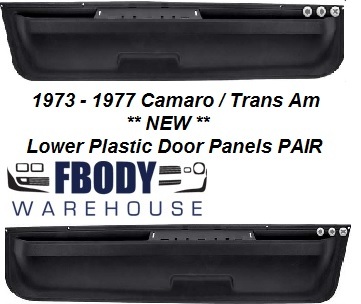 If you are not running a fan in your car instead or fabbing up some nightmare to cover the holes in the body tub in the engine bay compartment, simply install these delete plates. They mountinto the factory holes and offer a clean looking delete on your factory NON AC car! 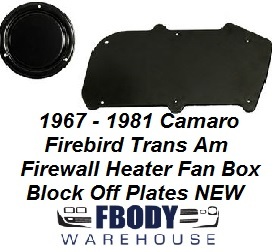 This is a new replacement outer fan box cover for 1967 - 1981 Camaro and Trans Am. 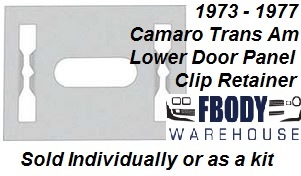 Technically correct die stamped steel reproduction set of the original rare factory block off plates for the firewall heater assembly and blower motor openings.